Captain your very own pirate ship on a Caribbean voyage. Use your word skills while fighting pirates, Arrr! As runaway pirate, Captain Lucy, you must embark on an adventure throughout the Caribbean to restore your father's name. Earn a reputation as a fearsome pirate with a mighty ship to command. Defeat your enemies and learn to talk like a pirate, Arrr! Follow the story as you sail around the Caribbean and solve the mystery of your father's disappearance. Buy new ships, gain experience and learn new skills. Trade in exotic ports. Accurate real world locations and a game filled with exciting and REAL information about REAL pirates. 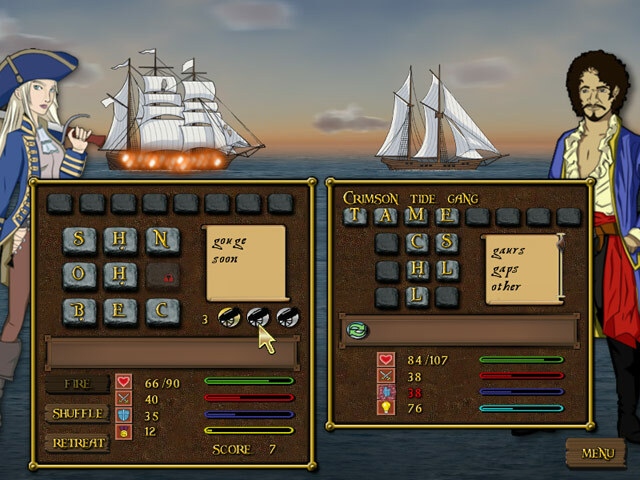 Go head to head with enemy pirates in real time. You and the enemy must create words from a random selection of letters. The larger the word the more powerful your cannon attack. Your skills allow you to buy and sell special coins that can be used in battle to boost your attacks, increase your defenses or interfere with your opponent. As you learn more pirate words you can charge up your broadside cannons to deliver a devastating blow. Meet a host of pirate characters on your voyage and unearth the devious practices of the East India Trading Company. Take on missions from merchants and traders. Become a land lubbing laughing stock or a dread pirate warlord queen.